Telkom SA has done a fine job of turning its profits and balance sheet over in the past year so they are barely recognisable from previous years. But the one area where they do have to prove themselves is in the service they give to their customers. The company, 40% owned by the government, lacks the fire to keep customers at bay. Complaints on Telkom’s service are high, and as customers are the company’s main source of profits, relationships with customers are not a dripping roast. It is not uncommon for prospective phone buyers to wait four to six weeks before their purchasing order is fulfilled. "Customer experience remains important to us and is an ongoing journey. We continued to focus on our systems and processes to improve customer experience. Our improved IT systems contributed in enhancing customer experience by reducing systems response time, increasing self service via mobile apps, and reducing the multiple steps in the approval process for customers," says Group CEO Sipho Maseko. 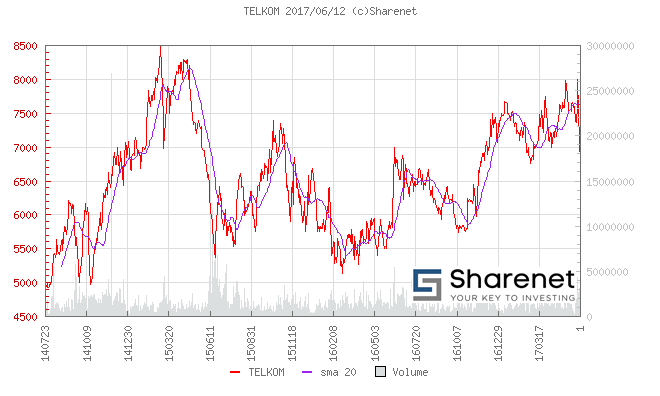 Telkom SA is a leading telecommunications company listed on the JSE, which produced some great results for 2017. "We made significant strides in a difficult operating environment which was characterised by regulatory uncertainty, increased competition and a weak economic environment," says Sipho Maseko. But on the financial front, Telkom shot the lights out for its shareholders. Revenue increased to R41 billion (vs. R37.3 billion in 2016) while profit attributable to owners increased to R3.8 billion (vs. R2.2 billion in 2016). Furthermore, headline earnings per share increased to 721.1 cents per share (vs. 323 cents per share in 2016). "I am pleased with our solid performance, which was boosted by the integration of BCX (cloud computing and data analytics) and the robust performance of our Mobile business," says Sipho Maseko. The share price has almost doubled over the past three years, appreciating by 93.92%. Telkom’s Mobile business continued to be the star performer of the group, and delivered service revenue growth of 38.4% and EBITDA of R660 million after four years of recording EBITDA losses. "Looking forward, we will continue to seek a sustainable growth framework for the group. We intend to invest in a manner that enhances our financial sustainability to continue creating a platform for growth. This is the primary reason for the increased investment in fibre and mobile," says Sipho Maseko. But has this really worked, and have customer complaints been reduced? Telkom believes that these new systems and processes have led to improved efficiencies by reducing costs, and provides them with a more complete view of their customers’ needs while catering for them more efficiently.